Charles initially spent about 2 hours discussing tail wheel aircraft peculiarities as well as taxi, takeoff, and both 3-point and wheel landings. 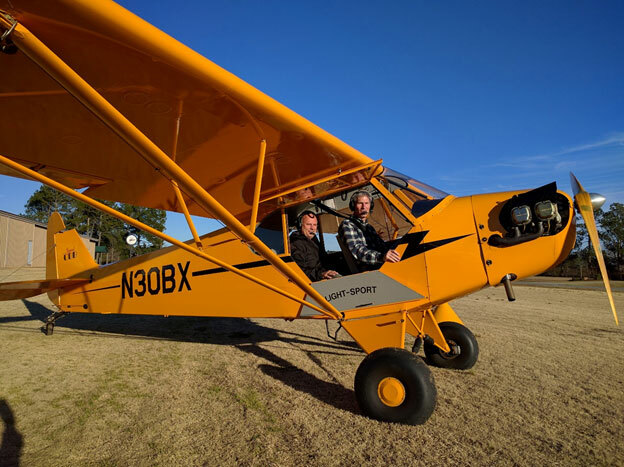 He has access to 5 different aircraft and picked the Cub Legend for my training. The Legend has 100HP and is a beautiful tandem seated high wing plane. He oriented me to the cockpit which had major differences to my normal aircraft, a Piper Warrior, being a stick, throttle and carburetor heat by your left thigh, and a crank trim by your left hip. I flew solely from the front seat and had great visibility over the nose. The sight picture in the Legend, being a narrow tandem plane, was much different than the Warrior. Charles demonstrated that it was almost impossible to create a prop strike by placing the prop vertical, he lifted up the tail of the aircraft as far as it would go above his head with me in the front seat looking ahead straight down. The prop still had 6 inches of clearance! I buckled into the four-point restraint and started out practicing taxiing a split-S pattern around the yellow cones laid out every 100 feet on the sides of the airstrip. After about four times down the airstrip back-and-forth my legs ached from so much rudder input. You may recall that last Friday was gusting winds to 21mph but by late afternoon the wind died down and we took off to another airstrip 10 minutes away which was longer and basically crop duster strip – not even on the map. We flew about 1.3 hours and I was introduced to 3-point landings and had more lousy landings than good. I actually thought I had more difficulty with the transition to stick with the throttle on the right side than the rudder work that I was expecting. As I drove home Friday night I kept thinking about Charles drilling into my head “Stick back, Back, BACK.” He used the analogy of a ratchet, to keep pulling the stick back and never forward on landings. The next morning I headed out to the airstrip where we immediately resumed and were in the air within 15 minutes. We initially went back to the same airstrip and performed 3-point landings until I was fairly comfortable. We then went on to a series of different airstrips all of which are not on the map! I use the term airstrip loosely. Some had trees on both sides, some strips 40 feet in width, some with air strip elevation and water obstacles. Charles reintroduced me to slipping the plane and we ended up doing more slips and extreme slips than I have ever done to date. We flew for about 3 hours and then broke for lunch. We then got back and after flying to several more fields we would opt to Williamston and I performed 8 landing on asphalt, 2 landings on each approach due to the length of the runway. We then landed on several more airstrips or really, patches of land, even landing at a RC field maybe 500 feet in length with an audience even though no radio-controlled aircraft were flying at the time. I felt that Eastern North Carolina was transformed into remote Africa and I was busting it as a bush pilot! I even performed a true off-field landing in a field. Charles told me he has access to about 100 different grass strips within an hours’ flight from South Oaks. We then worked on wheel landings which did not seem bad after getting more comfortable with 3-point landings. We flew almost 7 hours total in a day and a half making a total of 62 landings. As the sun was setting, I felt as if I was going to come back for more and solo at some point. Charles informed me that this was not necessary and he would approve my endorsement since he felt comfortable in my performance. So beware I now have my tail-wheel endorsement. As a bonus, I also have a new biannual flight review completed. Who knows where this will take my flying but it opens up more doors to different planes and places. I highly recommend Charles if you are interested, he made the whole process fun and the flying was definitely a blast!